You know what? Over the 26 years that I have been a recruiter, I have interacted with thousands of others recruiters..who confessed that they trespassed into Recruitment. Imagine it wasn't a planned 'career' move, at all. Ironic? Yet, Linkedin, probably the only comprehensive global database of recruiters recently showed there are 1,144,463 individuals with the term "Recruiter" in their job title. It is estimated that there over 3.5 million people working directly in recruitment worldwide! To me the personal journey has been driven by trying to help other people find their calling. (After ones' name, most people's individuality pivots on what their job is, right? Personal happiness follows professional happiness. Or is it the other way around :)!? Back in 2001/02 Executive Recruiters Association came together. Over time, as things would change, most of us had forgotten to celebrate March 9th. A couple of years ago, #ZohoRecruit shared a lovely tribute to Recruiters . 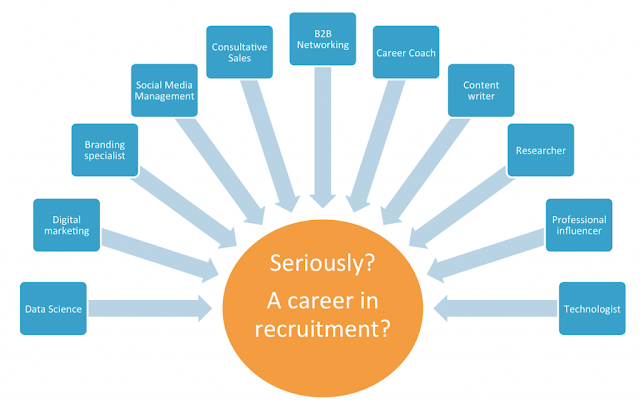 Flashback to earlier times, I recall sharing thoughts on the same event back ,on this blog, as the role of a recruiter has been changing -amidst all the disruption happening in a world that has been transforming itself with the growth of computers, mobile, internet & increased bandwidth! 2015 the biz of finding people for jobs? Today, there are amazing online communities all over the net, and it seems like the fraternity is finally coming on its own. Recruiters, Sourcers, Talent acquisition specialists, Trainers, Coaches...all stretching the bar. Almost every week, there are tons of content being shared for all of us to hone our skills -not only to find others, but to be found by others. #Dont miss there are over 40+ Facebook groups where similar minded hang out! Would you believe that the World Economic Forum in its "Future of Jobs" reports -that Recruiters will be no2 category in the professional services demanded by 2022?? Here is a caveat though. Unlike in the past though, where anyone and everyone with an email id or telephone number could pass of as a recruiter, the future professional will have to be different. Trust Greg Savage to have put it so well!! 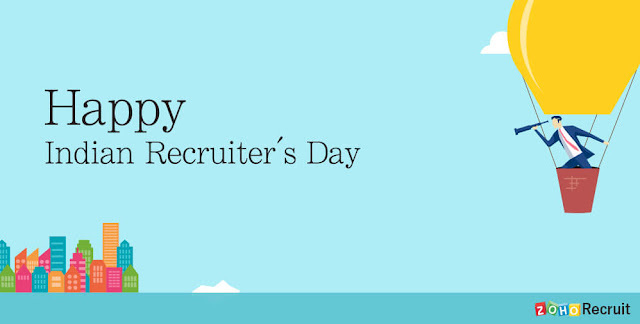 Interestingly, an International Recruiters Day is being planned on 4th March . PS : Listen to this rap #Apnatimeaayega ? Do you know any commercial feature film that has a recruiter as a character in it? The other day, as the Swiggy delivery boy exchanged the packet, I noticed he was a smart youngster. On probing, Ravi was a 2nd Engineering student, and confessed he was committed to it as as full time job -as he was getting paid, about Rs 35000 -monthly-including incentives. “What’s the point of going daily to college?” He wasn’t sure if he would even get half of that- after attending classes for 2 more years, and so would just do the enough to get the necessary attendance and pass his exams! Earlier last month, I was invited as a panelist at the 9th Higher Education & Human Resource Conclave, Hyderabad 2019. The topic : "Human Resource’s Role in the changing scenario of Employment, Innovation and Entrepreneurship in the New India". 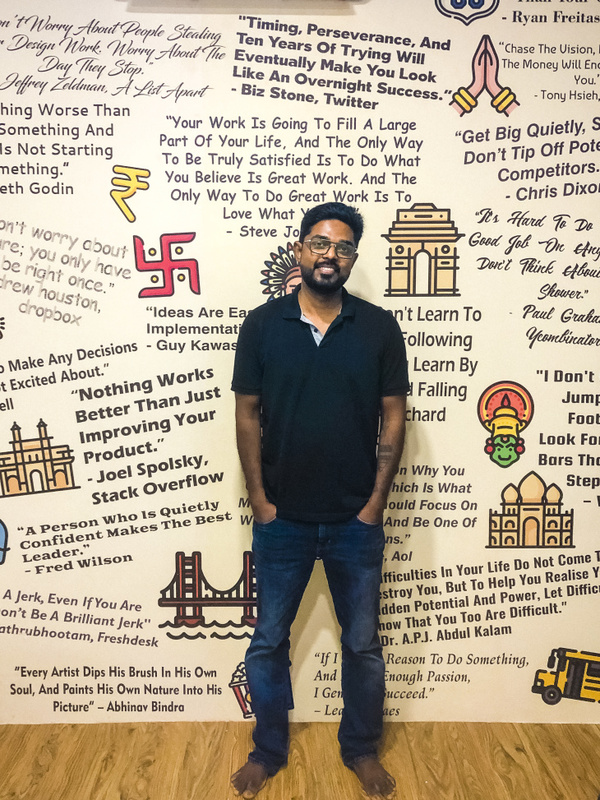 The speakers were across some of the leading hiring community from the corporate world, and Government, and the event was well represented by the Educational institutions, pan India. It was inspiring to see 'those who matter' in the ecosystem, sharing their concerns, and setting expectations for improving employment, and their best practices . As a ringside observer of the changing dynamics -amidst the perhaps the most disruptive of decades in the history of world, my observations, were, kind of tangential/ contrary to those being deliberated & I could sense some discomfort!! -It is time to stop looking thru the 'rear view mirror' and achieve marginal increments. One needs to focus on the road ahead, 'windshield' and navigate the possible obstacles/ challenges. -Focus on placements/employment is passe'. Instead 'employability'? The tenures of engagement have significantly reduced, and so the onus of career is now on the individual. -Businesses are becoming hybrid. And we as consumers are so used to changing our lifestyles - but when it comes to our profession, are we in a time warp? Google has got into cars. Is Amazon a logistics company? General Motors has probably hired more IT professionals in the last 3 years than automobile engineers. So are the skills needed in the new age employee . Given the technological advances, AI, ML, data science aren't new jargon anymore. Employers want people who have hybrid skills. App developers no longer content with coding skills, but with knowledge of design, marketing, and more. Marketing professionals strong with SQL queries to analyze customer needs better. The list goes on. Perpetual learning is the key. So are the educational institutes able to impart the need for learning to learn, unlearn, and relearn? Somehow I sense an increasing 'entitlement', across the stakeholders.Time to change the way we have been looking? And yes, I see the millennial are a smarter lot. Perhaps with lesser attention spans. But lot more savvy to the changing habits. 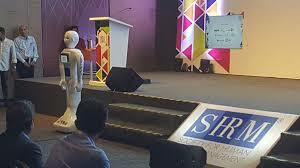 Over the last week, SHRM just concluded their Tech Conference in Hyderabad. 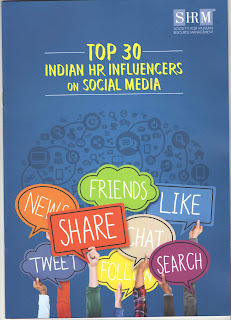 This year too they brought out a list of 30 most influential HR people on social media. #Humble Brag - I am delighted to be featured in this list! Here is the link for more details on the methodology, and the list of the individual names. And during this time, I was bestowed with beginners luck, as I found myself amongst some top recruitment blogs. Blogging made one google-able then, and of course it was Linkedin, Facebook, Twitter that perhaps been changing the game since. Yes,I was fortunate to be listed twice in the list of top 20 by SHRM in 2013 & 2107.I must confess that the first time I was overwhelmed-and when it happen later after a gap,I didn't think I would belong there for too long :)! I am very much conscious, that as the world now sees more millennials coming in to the workforce, the future would be engagement on Snapchat, Instagram, Pinterest and the like, and I am severely challenged on those fronts now!! To me, social media has been the window to the world of learning. Be it blogging, or the social networks, or the engagement platforms, it is simply amazing to note that the universe of networking is at one's finger tips. I have been essentially following thought leaders across different domains, and curating information, it helps me to relate to the ecosystem very well, and stay relevant. They say the Six degrees of separation has since reduced. Facebook (in 2011) said that the average person was separated by 4.57 degrees-and it is now supposed to 3.something! In this world,where Google is the GOD on the information highway, we have some exits -to connect and engage with some individuals who can help us be enlightened with some insights. Please do feel free to reach me- if I can add value to your network. It is possible that I can help you connect to someone-who might be able to connect you to the person you need :)! 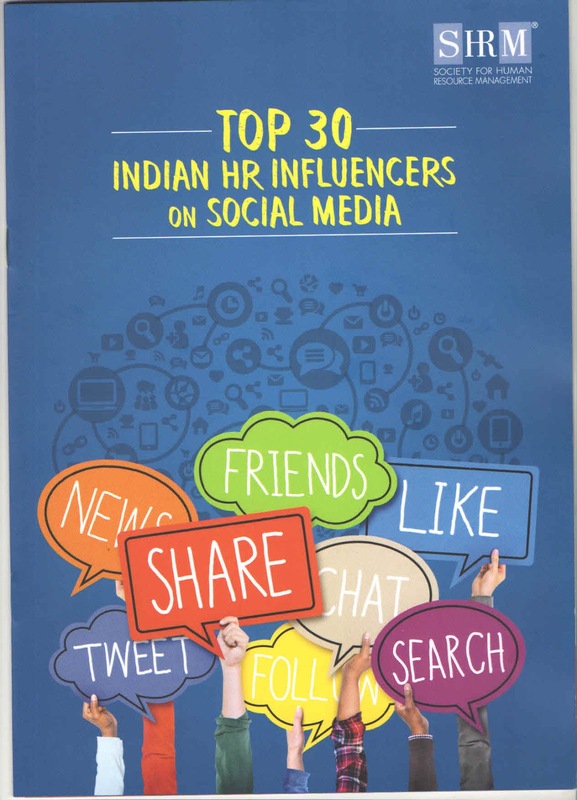 And meanwhile, feel free follow any of the twitter handles, among others, and be abreast on the latest in the HR domain in India. Again courtesy Vijay Bankar! Well, a lot was shared, deliberated, debated -and discussed, and one can easily get the online footprints if one were to google for "SHRMTech18". Information is passe- for me, the interactions and insights are the ones that make the difference. Here is a summary on twitter! -What impact an HR person has in an employee’s success. High/ medium/ low/ none? - What should an HR person do MORE? - What should an HR person do LESS? -Will Organization performance increase if they adopt an employee first philosophy? 2) Content is for sharing. The Context is the king! Niel Nickolaisen shared a well researched study on creating a workplace culture that attracts, retains and develops talent. And he walked the talk by sharing his email id- for those want a copy of the 40+ slides he presented as well as the 250 page ebook " The Agile Culture". 3) Change is the new Constant. While most speakers related to how we easily we adopt technology in our personal daily lives, and alluded to the bureaucracy at the work place(" try ordering a pen or a pen drive at office"), the 1000+ audience were enlightened as a bureaucrat, IT Secretary to Telangana Govt Mr Jayesh Ranjan narrated some of the innovative work done in Skilling courtesy TASK. He rattled the way -the paradigm has shifted with the Government intervention in students being taught Tizen (Samsungs OS), setting up training schools to cater to Apple's dev centre, and Wipro admitting the 'trained graduates' now needed just 15 days to be deployed on projects ( compared to 180 earlier!!)! The variety of topics needed concurrent sessions to cover the entire gamut of discussions across products, services, new forms, Tech talks, Demos, apart from the informal chats across the networking sessions. Guess I cant do any justice trying to convey the charged energies -thanks to Sunita Bhuyan who demonstrated how "Music for Wellness" can be used as an alternative approach to L&D!! And ofcourse an aggressive "safron clad" moderatorPankaj Bansal who got the audience glued to their seats on a Friday evening as he goaded a set of 3 HR leaders and 3 Business leaders to go at each other -about the future of HR- with the buzzer et al! As a person who has seen the ringside exposure of the disruptions technology has had on business in the last 3 decades,I come back relieved-there is no real need for the gloom and doom around-there is enough and more for those who are sensitive to the changing needs of the ecosystem, and learn, unlearn and relearn. Abhijit Bhaduri -who topped the list of 30 HR Influencers in India using social media, attributed his thanks to the 650.000+ follower community- who he calls 'the largest board of advisors' for reading, commenting and advising him !! Psst..for those who feel threatened by the rise of AI, ML, Bots and others, here is something to reflect..we humans have a little more time to get our act together ! HR as a function has gone through significant changes over the last few years due to the evolution of technologies/ digitisation etc. Today AI has a huge impact on the way companies hire, manage, and engage with the employees. Earlier this month, as a precursor to the SHRM HR Tech Conference 2018, SHRM Forum had organised a interesting event. · What’s changing in HR due to technology advancements and automation? · Which part of HR can be replaced and what will survive? · What role will HR play in the future? How can HR be better prepared? · What are organizations doing to develop newer, relevant HR skills in the context of digital transformation? What transpired was a truly 'Design thinking' approach. 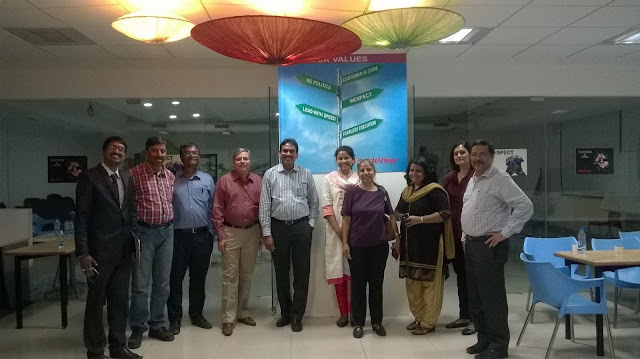 Given that the audience was a motley mix of HR professionals along with Consultants, and Service providers -or rather practitioners, the esteemed panel decided to instead convert it into a Round Table -to engage and interact with the group. 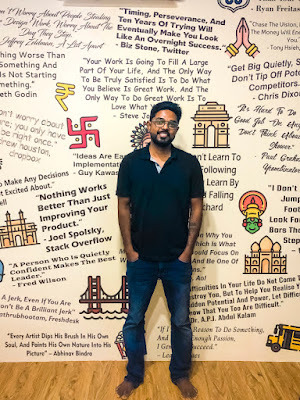 It was perhaps among the best learning experiences, as all chipped in with different perspectives across the ecosystem .One cannot but not mention that Sunil sensitised the operational issues, and Ramlal Waghray, a technologist turned entrepreneur, triggered us to think beyond the surface. Well, the format was so engaging, that quite a few of us participants, stayed back to have private tete a tete, with a promise to network and learn more, offline also :)! Want to deliberate more on this topic? We have William Tincup giving the key note on the topic on 27th April,as he shares his view points on how Artificial Intelligence has impacted Human Resources function and more so specific to Recruitment. In this session, he would also bring in the comparisions between the leverage of AI technologies in India and the West. Its still not too late..Just 3 days to go..Register here :)! PS : Yours truly is honoured to be amongst the blogsquad -do give me a shout if you are there. Else follow @achyutmenon for keeping abreast. Weekend Smiles..All in a days work! 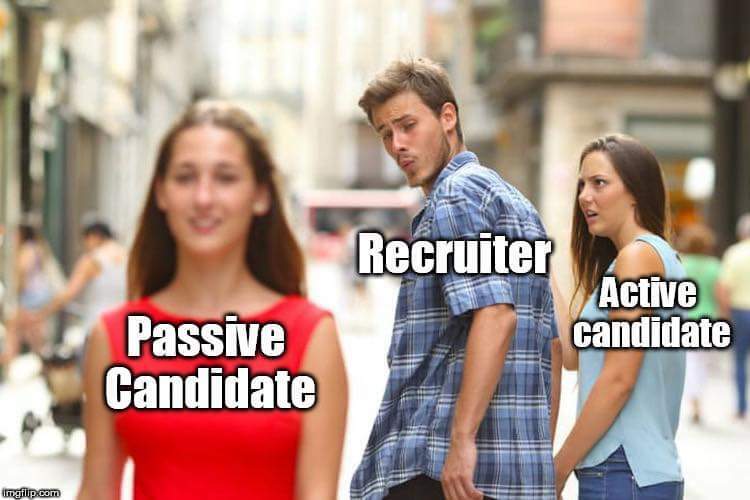 Only a recruiter would understand!! Time to recharge, refocus, and renew. The countdown has begun. 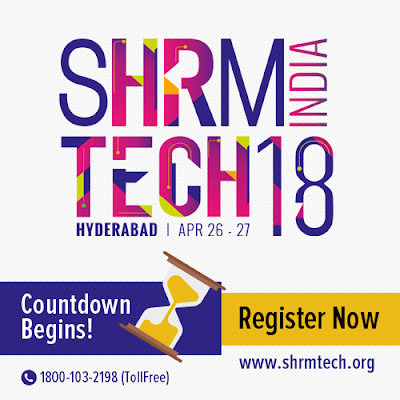 The SHRM India HR Technology Conference in Hyderabad has over a 1000 delegates registered to listen to over 70 speakers and engage in a knowledge/breakout sessions. As a person who has had the ringside view of the changing landscape in Talent acquisition, I am keen to know of the approaches/best practices in hiring and retention. And particularly what is being done with respect the first basic step of hiring- Scoping. It is ironic that most job descriptions are at best laundry lists, or even cut paste jobs-hardly in sync with the life cycle of the company's growth-with very little attempt to supplement, (if not complement) the in-house skills. Sourcing and Screening have already seen a lot of changes, courtesy AI and ML, and perhaps speed up the process-but one must realise the difference between commodities and human beings !! Selection and Retention need a personalised touch that can build on the analytics and predictive models -to create a better impact. Do check out the agenda here. Should you be dropping by at the event, please do give me a shout. It would be wonderful to catch up over a cuppa coffee and compare notes. Anyway, please do stay tuned by following some of us, part of the Blogging Squad, on twitter-you can be there will be a lot of bytes being shared on #SHRMTech18.